Every year it’s the same. November begins and I think that maybe it’s time to start my Christmas shopping, but I don’t. Suddenly I am celebrating Thanksgiving, then December arrives with its daylight quickly dimming and the days ticking away like seconds on a stopwatch. Now here we are: one week until Christmas and I’ve barely started my Christmas shopping. Hello, my name is Erin and I am a procrastinator. Let’s forget the Christmas presents and stressful shopping that goes along with it. You know what I want for Christmas? I want to cozy up on a couch with my sisters and cousins and watch the old movies we used to make when we were too young to be embarrassed by ourselves. I want to bake gingerbread men and women with my mom and make funny scenes using them as the characters. I want to bite into homemade checkerboard cookies, eating each square separately, letting the buttery shards melt on my tongue. I want to sing Christmas songs around the piano, with my Dad playing the keys as we all belt out the songs. I want to wear fleece pants and slippers and curl up with a good book and a good cat (preferably one that doesn’t vomit regularly or wake me up in the middle of the night by pulling threads out of the nice curtains with her claws.) I want to watch White Christmas and have my sisters do a reprise performance of the “Sister, Sister” song from my wedding. I am very lucky and grateful for the many wonderful people and comforts in my life. I would much rather have the simple gifts of time with people I love and time for the things that I love doing than any tangible presents that could be bought. If you haven’t bought me anything yet, don’t. Next year (maybe starting in October) I’m going to plan to do Christmas a little differently. While I won’t be spending Christmas with my sisters and parents, I will still do many things on the aforementioned list. I will bake cookies, I will read books (good cat or not! ), and I will leap around my living room while listening to Christmas songs. And since all of this list involves doing good for myself, I am also going to do good for others, including some volunteering and finding a way to help in Syria by donating to a reputable charity, as I am horrified by the news I see coming out of there. 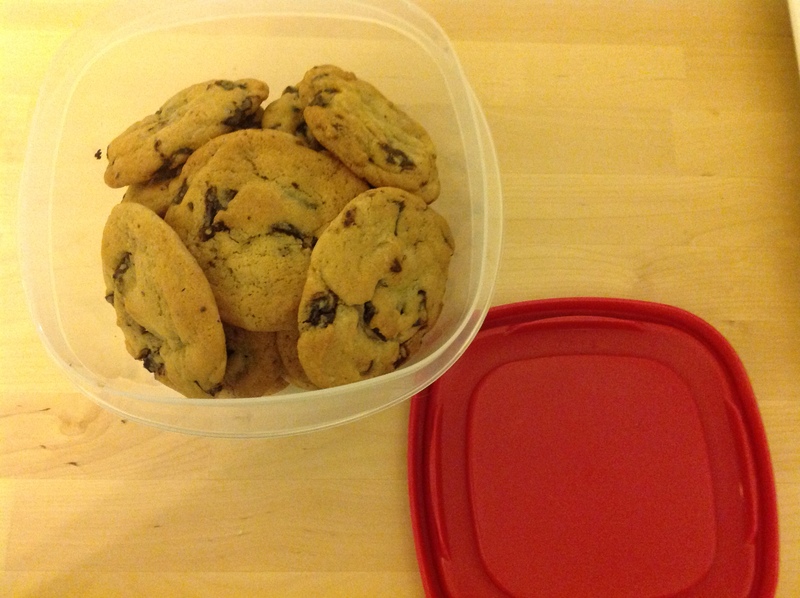 I am also planning on taking some of my freshly baked cookies to the neighbors (checkerboards on the list!) I have our family’s favorite rum balls ready to add to the cookie platter. My mom always made these rum balls by the dozens for our family when I was growing up. I remember we ate them happily as kids, despite their strong rum-y taste (or perhaps because of it!). I am surely giving this recipe too late as the balls are best made ahead of time so that they can cure and really absorb the flavor of the rum, but perhaps you can make them now and save them for a New Year’s party. Mine have been ripening for about two weeks now, but I just haven’t gotten the chance to write about them yet! Admittedly I have altered the recipe a little bit. I wavered between making the vanilla wafers from scratch and just buying them, but in the end, I decided that it was highly unnecessary to make them, and it would ruin the authenticity of the family recipe. I did, however, substitute honey for the corn syrup as I simply don’t use the stuff enough to really want to buy it. I figure that good family recipes are like a game of telephone, anyway. With each person you pass it along to the message changes just a little bit. May your Christmas be full of comfort, joy, love, and all the things intangible and tangible that your heart desires. And may it also contain some rum balls! Start by crushing vanilla wafers in a plastic bag using a rolling pin or pulse in the food processor until they are crumbly but not too fine of crumbs. Measure out a cup of the crumbs. 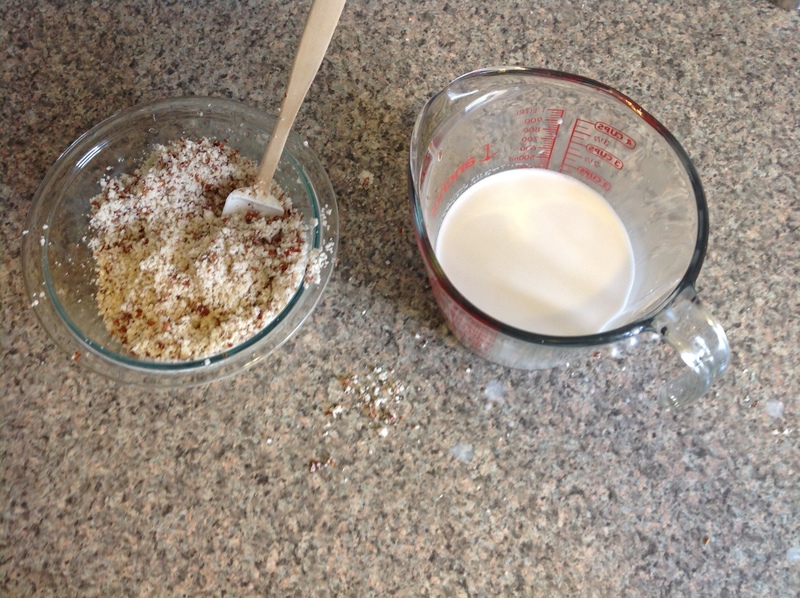 Combine all remaining ingredients with the wafer crumbs in a medium sized bowl and mix together. Add more honey or powdered sugar depending on the consistency. You want it to be a dough that will hold together when rolled into a ball, but not too dry as the wafer crumbs will soak up some of the rum as they sit. Scoop into even golf-ball sized (or smaller) balls and roll in more powdered sugar to coat. Let sit in a well sealed container for at least a few days and up to several weeks before serving. *They wouldn’t be rum balls of course, but if you really don’t like rum, I imagine these would be splendid with any other alcohol you like. I would think a Grand Marnier, Bailey’s, or Kahlua would be especially good, or even a whiskey of your choice. Summer Berry Buckle (NYT), Blueberry and Peach Crisp, Black Bean Salad, and homemade Chocolate Cake with Raspberry Jam filling for a former co-worker. Here’s a photo of our beautiful living room in our new house! (Don’t mind the Zappos box that I forgot to remove when taking the photo.) Don’t you love the orange front door?! I also made a Snickers pie (no Snickers actually in it, but rather a pie trying to imitate a giant Snickers!) It was rich, but it was a hit! I improvised the recipe off a Pinterest one I had saved months ago. The cake below is a chocolate stout cake. Having a house also means we now have a backyard and our very our own grill! We got to work right away grilling zucchini, chicken, and sausage. The photo on the right was a delicious Vietnamese-style noodle salad with grilled chicken. In the end, the recipe tasted very similar to one of our favorite Boston food trucks, Bon Me! Thanks again NYT Cooking! Now that fall is upon us I’m looking forward to making some apple pie, pumpkin bread, and other cozy treats. Hopefully the next time you hear from me will be sooner rather than later! 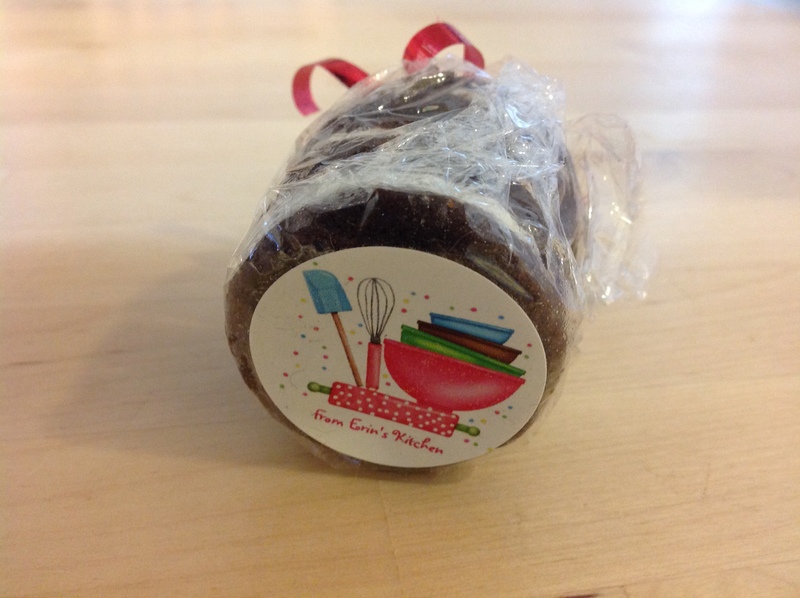 These are buttery chocolate shortbreads smashed together with a sweetened thick icing. The ingredient list is short (and sweet!) You probably already have everything at home to make them. Well, except the cake flour, but I didn’t let that stop me! Sticky chocolate dough. Don’t add more flour to make it better. Stick it in the fridge. Let that softened butter firm up again. I used a wedding gift champagne glass as my cookie cutter. That’s because I’m creative. Also I do not own a round cookie cutter. Doesn’t a round cookie cutter just seem unnecessary and boring? Freshly baked below! (No rising involved so they don’t look that different from the unbaked above) Sandwich them together. Eat a few. 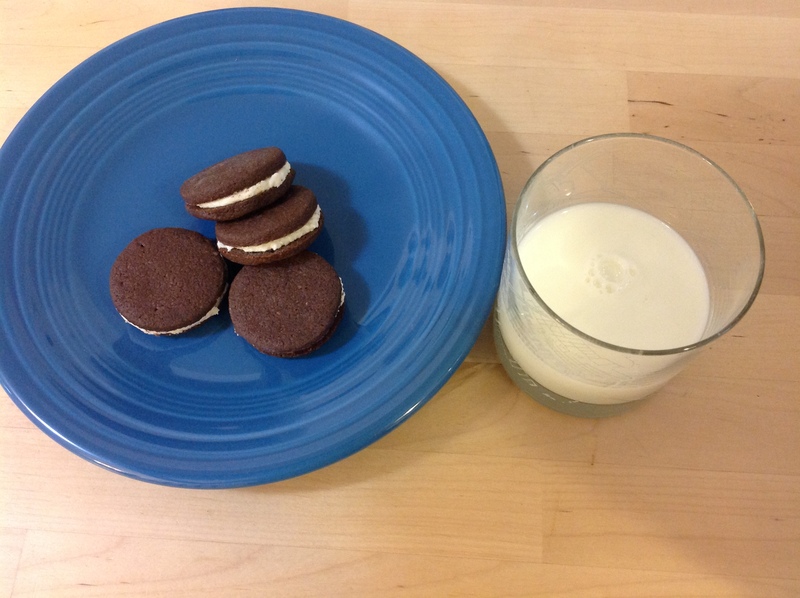 Dip in milk if desired. Wrap up for a friend. Stamp it with your seal. Let them know: I made these, people! 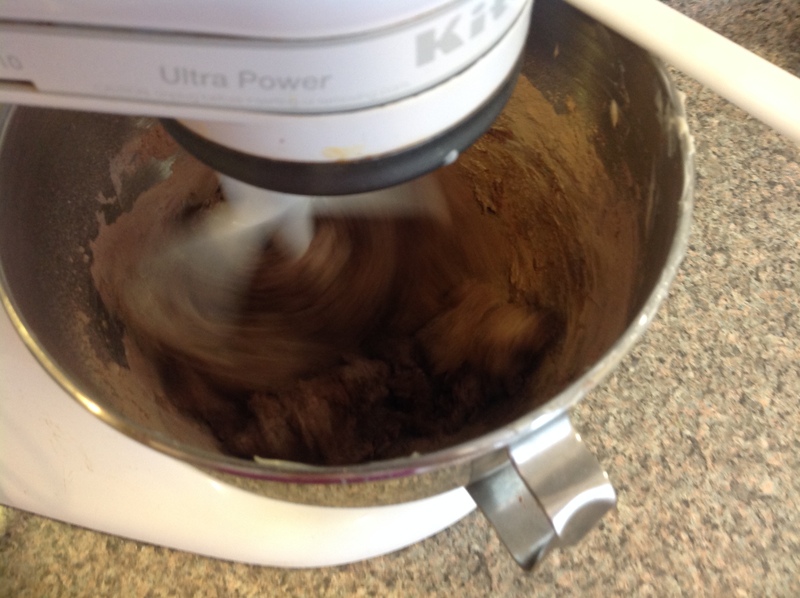 For the cookies, beat butter with an electric mixer until smooth and fluffy. Add sugar and vanilla and mix in. 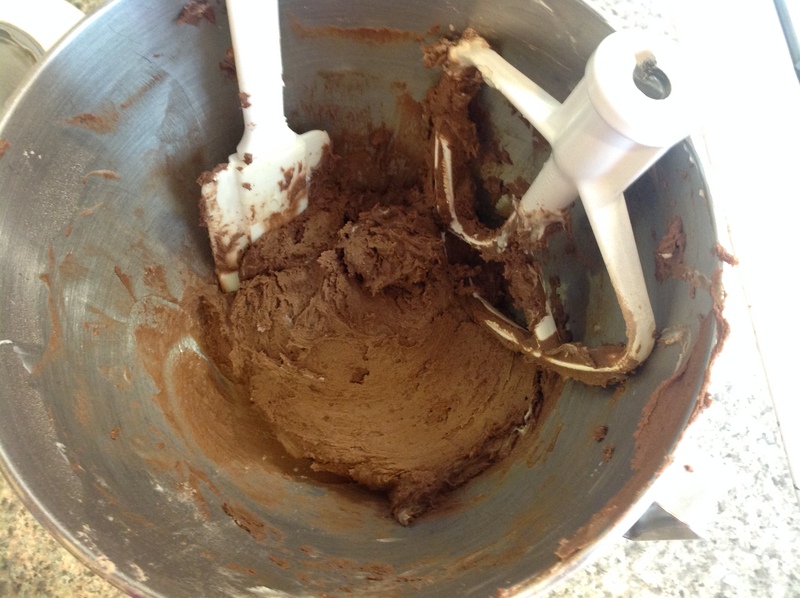 In a separate bowl combine flour, cocoa powder, and salt. Add the flour mixture to butter mixture and mix until there are no streaks of white. Do not over mix. If it is sticky (which it should be) wrap in plastic wrap in a flattened disc and refrigerate until somewhat firm – 30 minutes to an hour. Divide the dough in half and keep one half in the fridge while you roll out the other. Turn out onto a well-floured surface and roll until 1/4 inch thick. Be sure to check the dough as you are rolling it out to make sure it isn’t sticking. Flip over and re-flour as necessary. Cut out rounds of dough (about 2 inches) using a cookie cutter, drinking glass, or champagne glass (if you’re feeling fancy). 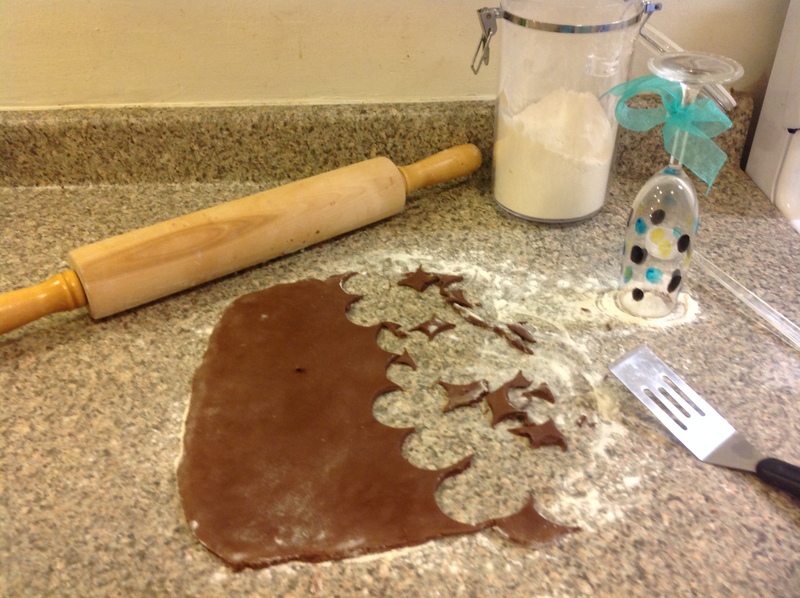 It is very helpful to flour your cookie cutter every few cookies so the dough doesn’t get stuck. 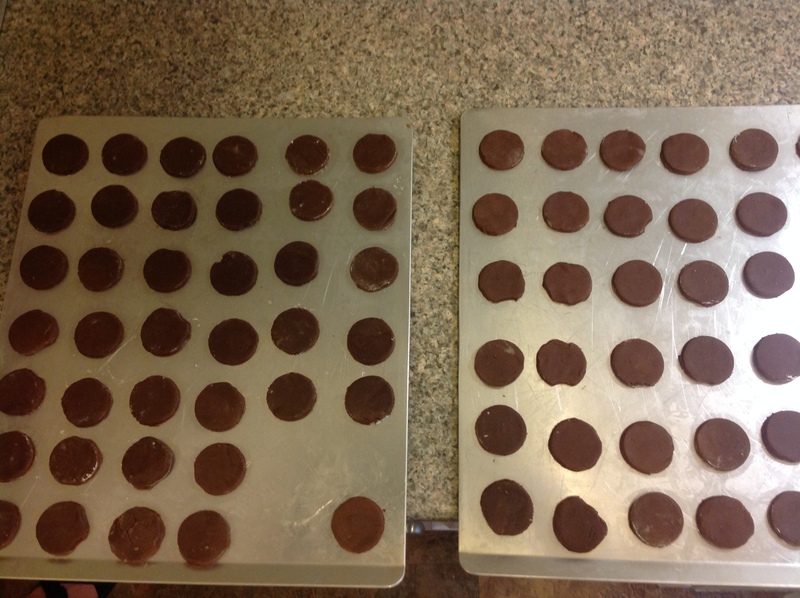 Space the cookies apart about a 1/2 inch on an unlined, ungreased cookie sheet. 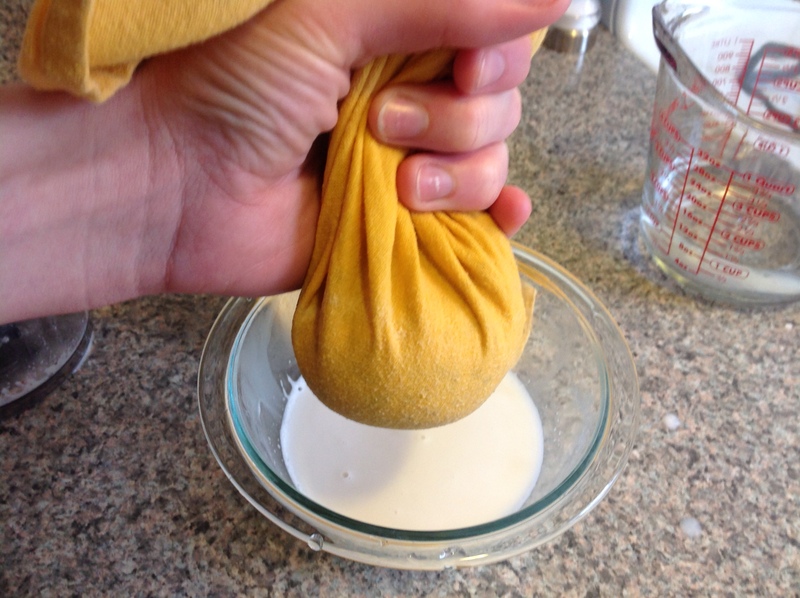 Be careful transferring them as the dough is fragile. I used a thin metal spatula to keep from crushing the edges. Refrigerate the cookies on the sheet until firm again, while you finish rolling out the rest of the dough (10 minutes should be about right). Re-roll scraps and use as much as possible without overworking the dough. 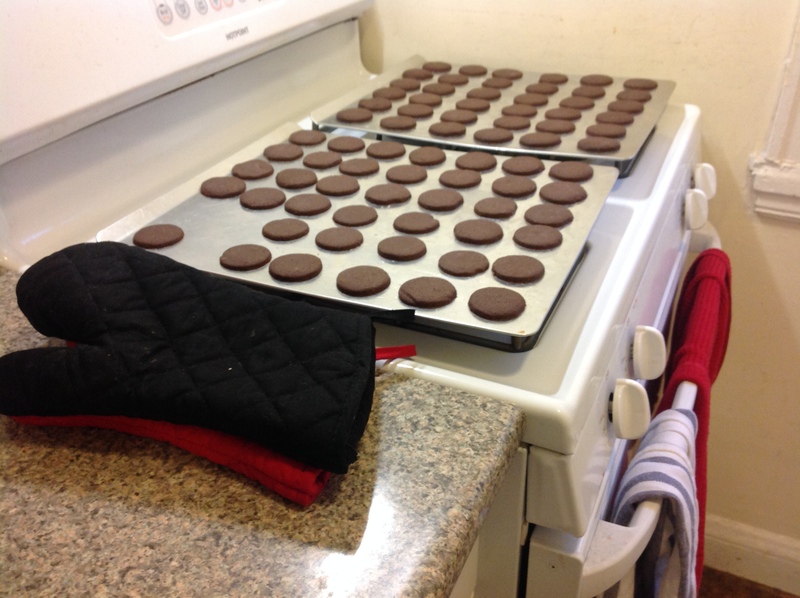 With the cookie sheets of cookie rounds still in the fridge, preheat the oven to 350 degrees F. When preheated, remove the cookie sheets from the fridge and bake the cookies for 18-20 minutes, switching racks and rotating the sheets halfway through to ensure even baking. Cookies should be slightly firm to the touch. Be careful not to over cook them. Since they are already dark, it can be hard to see if they’re done by their color. Let cool and prepare the filling. 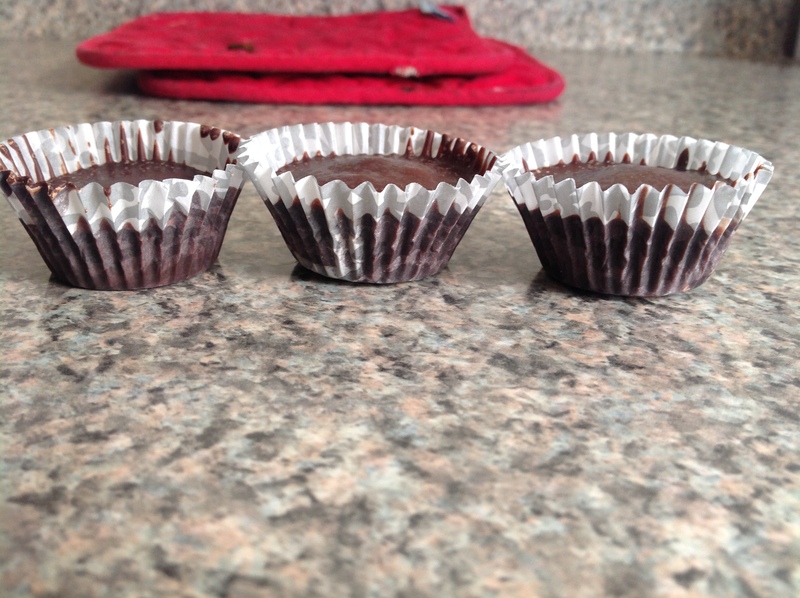 For the filling beat the shortening with an electric mixer to loosen it up. Add sugar and half the milk, beating to incorporate. Add remaining ingredients and stir until smooth. To frost, dab a spoonful of the filling on the bottom of a cooled cookie. 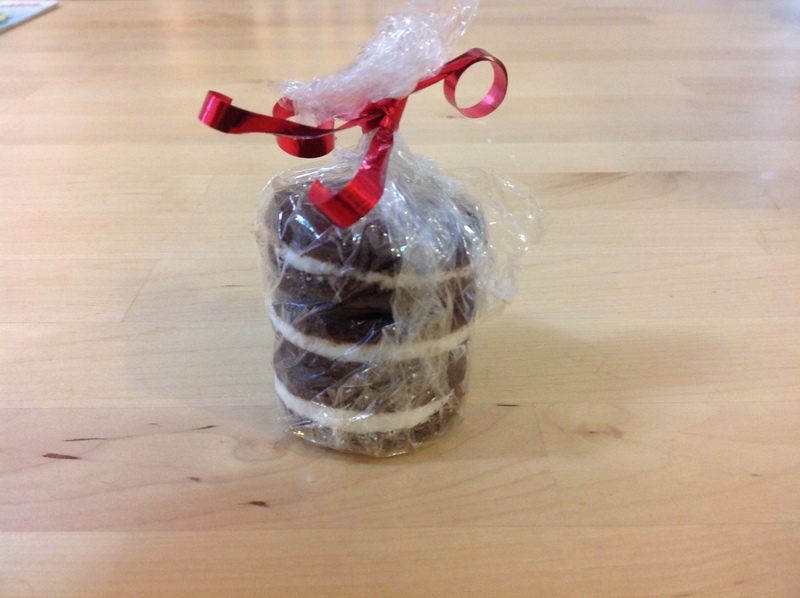 Top with another cookie and gently wiggle and smoosh it to distribute the frosting evenly or just spread it on one cookie evenly before putting the second cookie on top. Repeat with remaining cookies. Enjoy with milk. I found this made just the right amount of filling for my cookies, but it depends how much you put on and how many cookies you end up with. 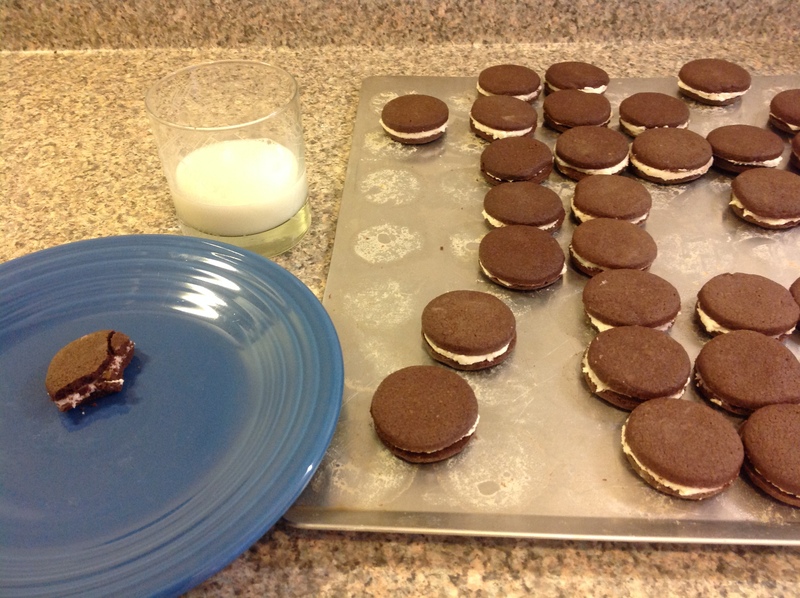 You can always measure out the filling and divide it exactly between the cookies. As a side note: I decided to get rid of the post numbering. Does anyone really care how many “posts” I’ve written? Probably not. If you do, let me know 🙂 Thanks for reading as always. 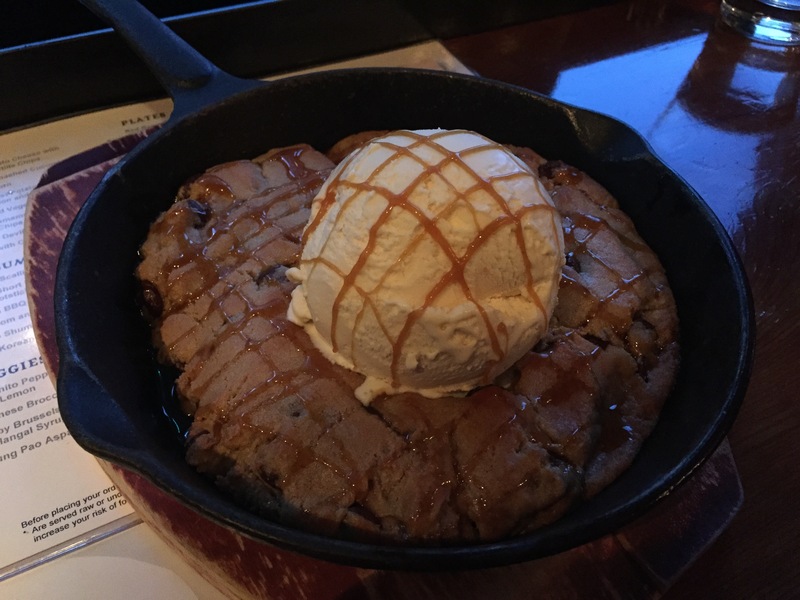 Remember that ooey gooey chocolate chip cookie topped with vanilla ice cream at Blue Dragon? Fact: I have always loved to experiment with new recipes. I started out trying basic recipes when I was younger and as I’ve become a more proficient chef and baker I have graduated to slightly more unusual recipes. I’m not talking crazy-out-there-no-one-has-ever-done-this recipes, just ones that your average home cook wouldn’t make. Some of my experiments have been motivated by my desire to feed those with special dietary requirements such as vegans and gluten-free folks, and some simply by my desire to see a new process actually work. This almond milk recipe meets both of those needs – vegan, gluten free, and a new process for me. After talking with someone who knows a lot about food, nutrition, and digestive health, I saw a different perspective. She said something along the lines of: You may be frustrated now, but think of this as an opportunity. Your body is telling you something is wrong and you have the opportunity to fix it. Though it took a few days for her words to really sink in, I realized she was right. I have the opportunity to improve my health immensely while I am still young, and hopefully I can prevent anything too serious from happening in the future. I like to think of this homemade almond milk as part of my opportunity for better health. When I went through a test period of eating dairy free, I made this almond milk to go with my favorite homemade granola. I have generally disliked the store-bought kinds as they taste too strongly of toasted almonds, so I figured this was the perfect opportunity to make mine how I wanted it. And the recipe was easy. It only requires some preparation and a little bit of time. Keep in mind that without the preservatives it will only keep a few days, but if you make small batches this shouldn’t be a problem. 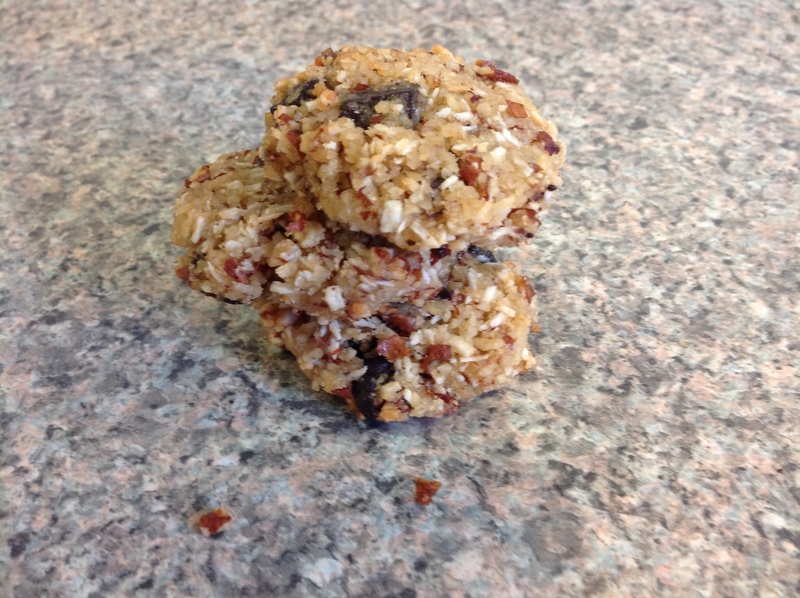 Whether you’re dairy free or not, I hope you try this recipe and discover something new. And I hope it doesn’t take something like GERD for you to realize your opportunity to achieve your best level of health. Below is a photo recipe. 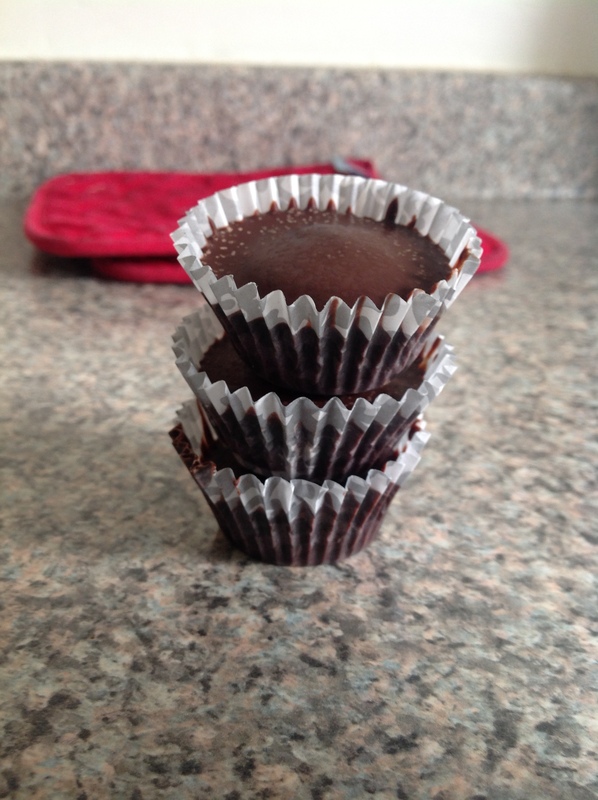 For details, check out this recipe that I used. First soak your almonds overnight in water. Drain, rinse, and add fresh water and blend in a blender or food processor. 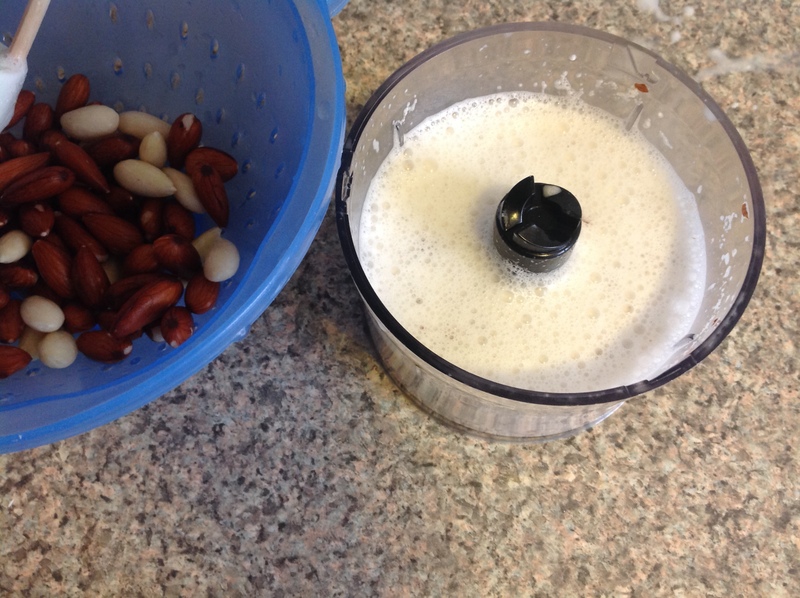 If you are meticulous you can remove the skins from all of the almonds (they slide off easily after being soaked). Just pinch them lightly between your fingers and be ready to catch the almond that might go flying out! The almonds will get broken up and make a creamy milk and almond meal. 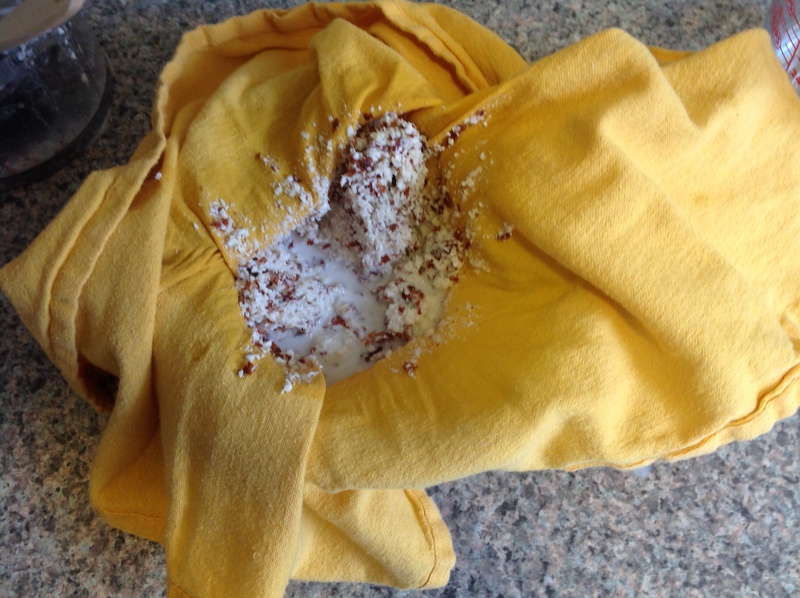 Place a thin kitchen towel or cheesecloth over a container and pour in your blended almond milk and almond mixture. 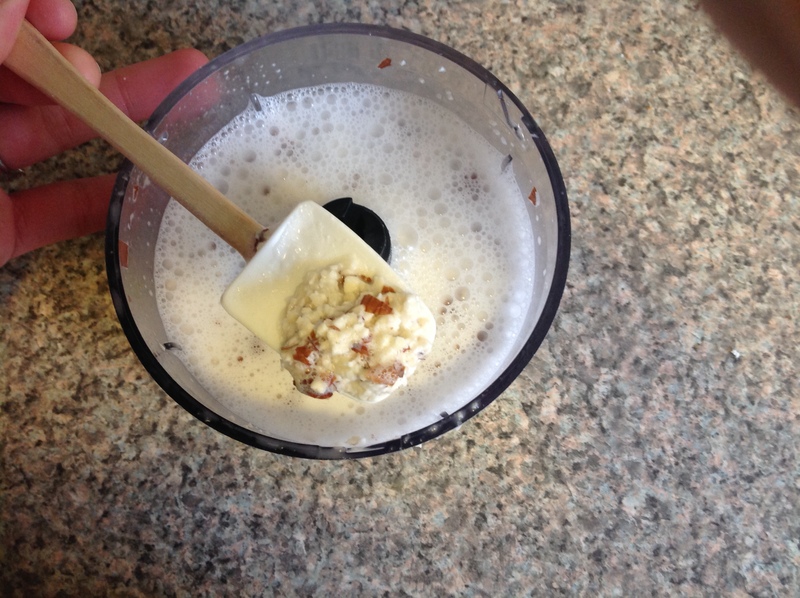 Squeeze all of the liquid from the almond solids. Once you have squeezed out all the liquid you will be left with slightly moist almond solids and almond milk! 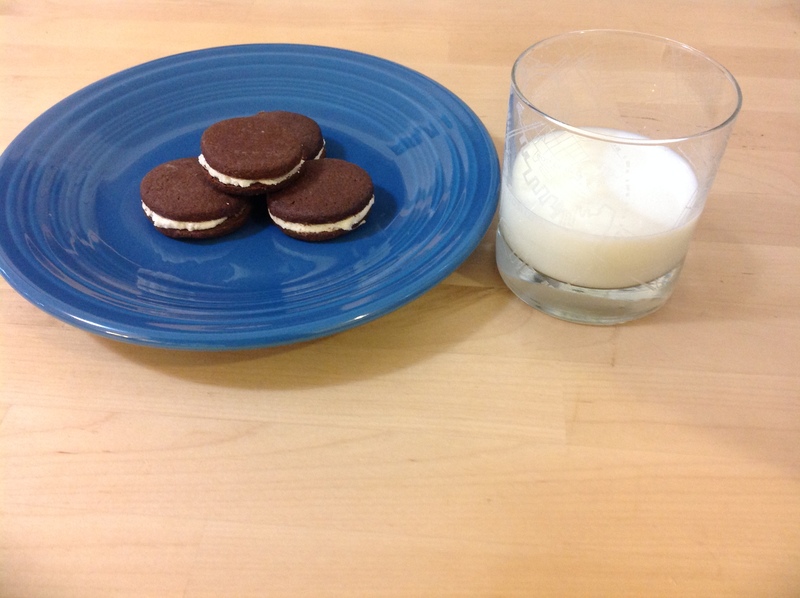 Refrigerate your milk and almond solids and save for a tasty recipe. 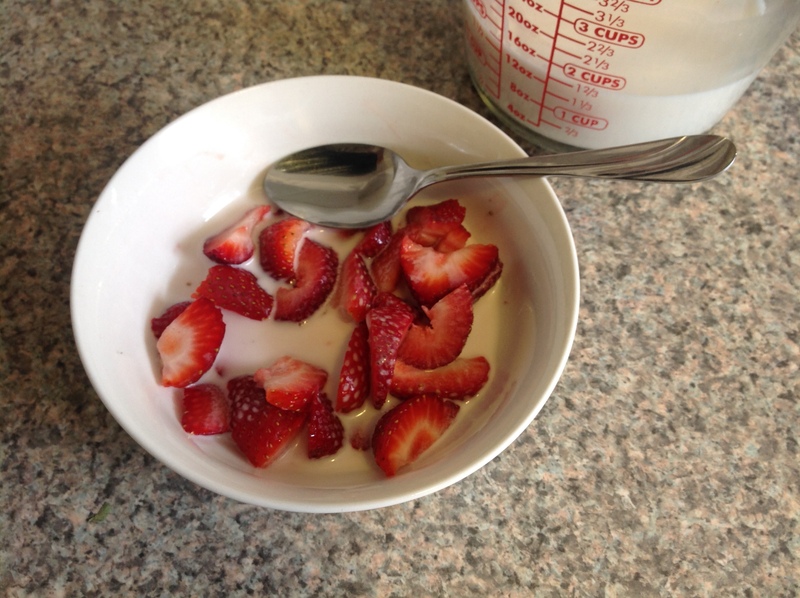 I enjoyed my fresh almond milk with strawberries! And the almond meal went to work as gluten-free almond meal chocolate chunk cookies later in the week! We ate a few on our road trip and put the rest in the freezer for later. March! Thank goodness. This is the month where I start to believe spring is coming soon (until I remember that last year on my birthday – the end of May – it was forty degrees and rainy!) Eh, I guess spring and warm weather may be a long way off, but here’s hoping. Why do I look forward to the spring? Sunshine, warmth, no ice to slip on, fresh fruit and vegetables in abundance! I will miss the snow days, but there’s always spring and summer break to look forward to. 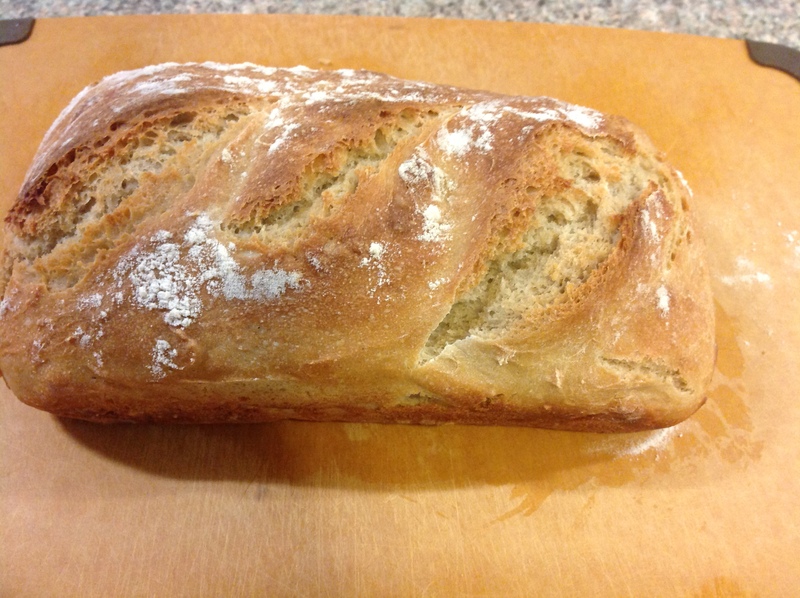 I’ve been on a bit of a hiatus from my blog, but that doesn’t mean I haven’t been cooking (of course). I haven’t been bloggin because I haven’t been cooking anything crazy interesting lately, due to my continuing issues with GERD. I’ve resorted to fairly simple (boring) recipes as the list of foods that I can’t eat seems to grow longer and longer and so I haven’t taken many pictures of them. I am back to eating wheat and gluten (for now), but still experimenting with other foods that might upset my system. It’s frustrating for someone whose job and life revolve around food, but I’m figuring it out. I hope to have more interesting recipes to share with you soon, but until the next time I hope these pictures will get you by. I only wish I had equally tantalizing pictures of beautiful fruits and vegetables! If that’s what you’re looking for check this out. Cheers and here’s hoping spring comes soon!